If you haven’t guessed by now, I’m a fan of creating my own Jamba Juice recipes. 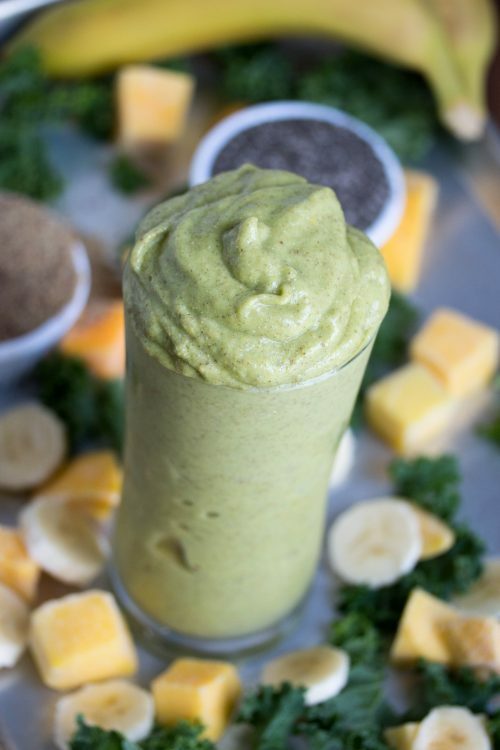 With a blend of mango, banana, and kale, this Jamba Juice Kale-ribbean breeze recipe will provide both your mouth and body with a creamy, citrusy nutritious boost. I recently moved to Austin, Texas and have loved spending my warm summer days by the pool with my family. I wasn’t sure what to expect since friends and family warned me about the brutality of the Texas sun. However, it’s been quite enjoyable! Maybe it’s been the pool OR maybe it’s been because we have daily smoothies to combat the heat. I have two small kiddos and any mom with young kids understands the constant worry over getting enough veggies and the proper nutrients into their cute little bellies. Finding, creating, and feeding our kids healthy options can feel like a full-time job! This is one of the many many reasons I’m in love with my Vitamix. That powerful blender can blend anything into pure creaminess! 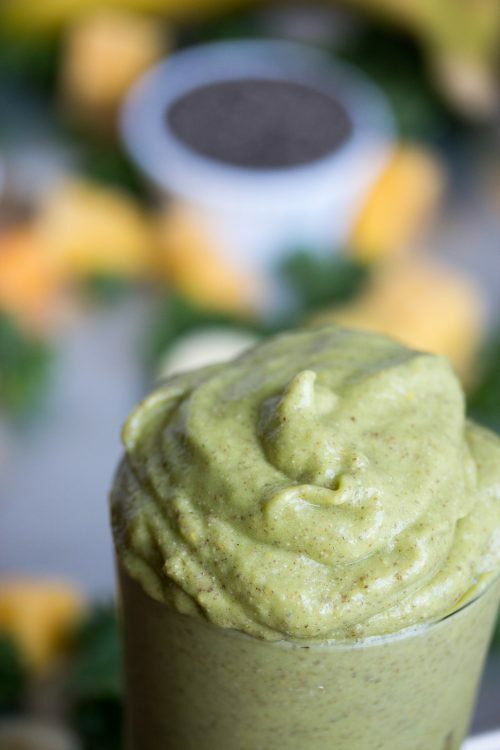 My kids get most of their vegetables in smoothies such as this Kale-ribbean Breeze copycat recipe. Want to find an affordable Vitamix? Purchase a refurbished Vitamix on Amazon (affiliate link). 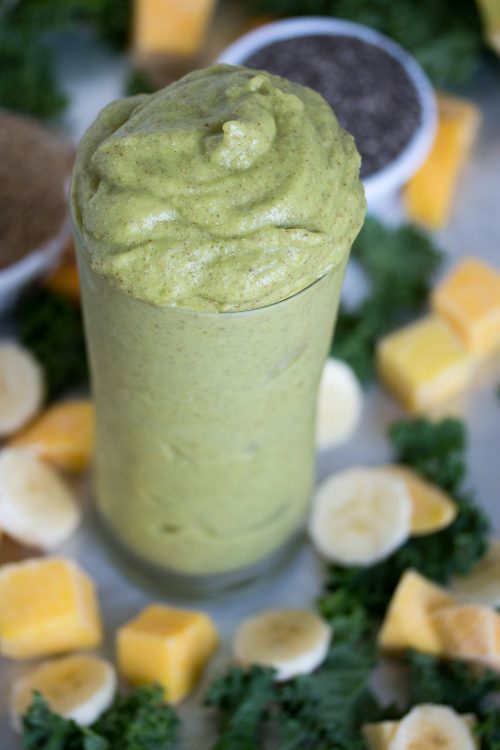 Since kale is a pretty tough little green vegetable, make sure to remove the stem and only use the leaves in the smoothie. Also, I’m a BIG advocate for properly washing your fruits and vegetables. I’ve tried numerous of vegetable washes, but I always keep coming back to my most favorite…. FIT vegetable wash. You will tangibly feel the waxes and dirt wash off your produce. It’s SO worth the additional 20 seconds to make sure all the dirt and junk is off your produce before eating. SO scrub that kale before throwing into blend. I have several other easy Jamba Juice copycat recipes such as Caribbean Passion, Mango-A-Go-Go, and Aloha Pineapple. They only have a few ingredients and guarantee you’ll love every single one. My main tip: Invest in a high quality blender! It does make a massive difference. Enjoy this Kale-ribbean Breeze! 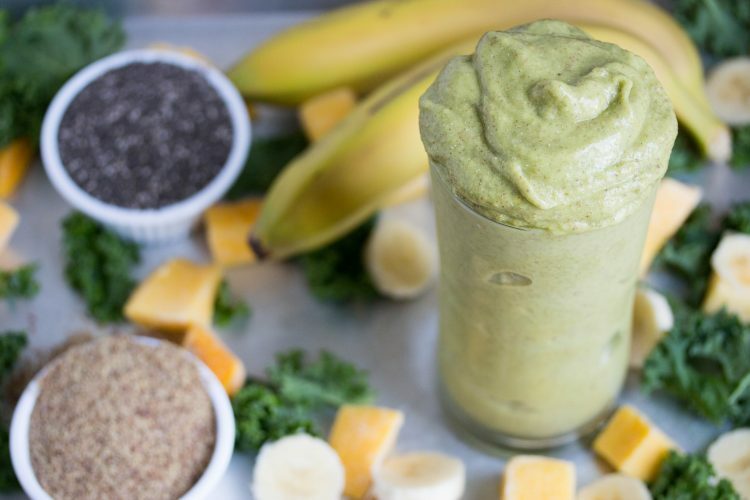 With a blend of mango, banana, and kale, this Jamba Juice copycat recipe will provide both your mouth and body with a creamy, citrusy nutritious boost. 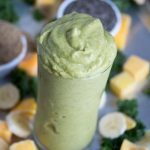 Frozen bananas are an inexpensive and healthy way to add creaminess to smoothies without using dairy. Make sure to always have a hand of bananas (5-6 bananas) frozen so you'll be ready at all times to blend up a smoothie. The bananas need to be yellow. Simply peel the bananas, place in ziplock bag in a single layer, and freeze 5 to 6 hours on a flat surface in the freezer.